Astronomers in the United States have announced the discovery of the "10th planet" to orbit our Sun. The largest object found in our Solar System since Neptune in 1846, it was first seen in 2003 - but important details have only now been confirmed. 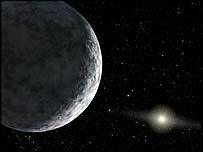 Designated 2003 UB313, it is about 2,800km across - a world of rock and ice and somewhat larger than Pluto. Scientists say it is three times as far away as Pluto, in an orbit at an angle to the orbits of the main planets. Its discoverers are Michael Brown of Caltech, Chad Trujillo of the Gemini Observatory in Hawaii, and David Rabinowitz of Yale University. It's not every day that you find something Pluto-sized or larger! "Brought to the same distance from the Sun as Pluto, it would be brighter. So today, the world knows that Pluto is not unique. There are other Plutos, just farther out in the Solar System where they are a little harder to find." It was picked up using the Samuel Oschin Telescope at Palomar Observatory and the 8m Gemini North telescope on Mauna Kea. Chad Trujillo told the BBC News website: "I feel extremely lucky to be part of a discovery as exciting as this. It's not every day that you find something Pluto-sized or larger!" "The spectra that we took at the Gemini Observatory are particularly interesting because it shows that the surface of 2003 UB313 is very similar to that of Pluto." The object was first observed on 21 October 2003, but the team did not see it move in the sky until looking at the same area 15 months later on 8 January 2005. The researchers say they tried looking for it with the Spitzer Space Telescope, which is sensitive to heat radiation, but failed to detect it. This gives them an upper limit of its size of 3,000 km, they say. The lower limit still makes it larger than Pluto. The discovery of 2003 UB313 comes just after the announcement of the finding of 2003 EL61, which appears to be a little smaller than Pluto. The discoveries will once again ignite the debate about the qualifications of an object to be called a planet, an issue the International Astronomical Union is wrestling with as the official naming organisation for this area of science. Modern techniques have revealed several far-off objects that approach Pluto's size, such as Quaoar (detected in 2002) and Sedna (found in 2004); and the promise of Brown and his colleagues is that more will soon be detected. Some researchers suspect there could even be Mars-sized objects lurking in this region of the Solar System known as the Kuiper belt.